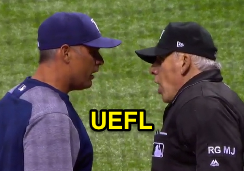 HP Umpire Larry Vanover ejected Rays Manager Kevin Cash (check swing strike three call) in the bottom of the 9th inning of the Tigers-Rays game. With none out and the bases loaded, Rays batter Steven Souza Jr. attempted to check his swing on a 3-2 fastball from Tigers pitcher Francisco Rodriguez, ruled a swinging strike by Vanover. Play reviewed and adjudicated by the UEFL Appeals Board (9-0-0), the call was correct. At the time of the ejection, the Tigers were leading, 7-6. The Rays ultimately won the contest, 8-7. This is Larry Vanover (27)'s first ejection of the 2017 MLB regular season. Larry Vanover now has 3 points in the UEFL Standings (-1 Previous + 2 MLB + 2 Correct Call = 3). Crew Chief Larry Vanover now has 3 points in Crew Division (2 Previous + 1 Correct Call = 3). This is the eighth ejection report of 2017. This is the 6th Manager ejection of 2017. This is Tampa Bay's 2nd ejection of 2017, 1st in the AL East (TB 2; BAL, BOS, NYY, TOR 0). This is Kevin Cash's first ejection since April 29, 2016 (Mark Ripperger; QOC = Y [Balls/Strikes]). This is Larry Vanover's first ejection since June 30, 2016 (Tyler Flowers; QOC = U [Balls/Strikes]). Wrap: Detroit Tigers vs. Tampa Bay Rays, 4/19/17 | Video via "Read More"